Avocados are super food by any definition. These are nutrient dense fruits rich in minerals, Vitamins and all the good fats we need. Avocados are grown locally in India for the last few decades but it is mostly in the southern hill areas of Tamilnadu, Karnataka and Maharashtra. North India gets Avocados either from the southern states or the imported ones. The Avocados grown in the north eastern state Sikkim is a native variety which is smaller in size but the flesh is equally good. I wish we grew Avocados more in the north India too and the availability was a bit better. I love this fruit and often find rock hard Avocados in the market and have been forced to throw away this expensive fruit just because it refuses to ripen. I learnt choosing the right avocados after numerous hits and misses. Will share my experience on finding the right avocado soon with a few recipes as well. 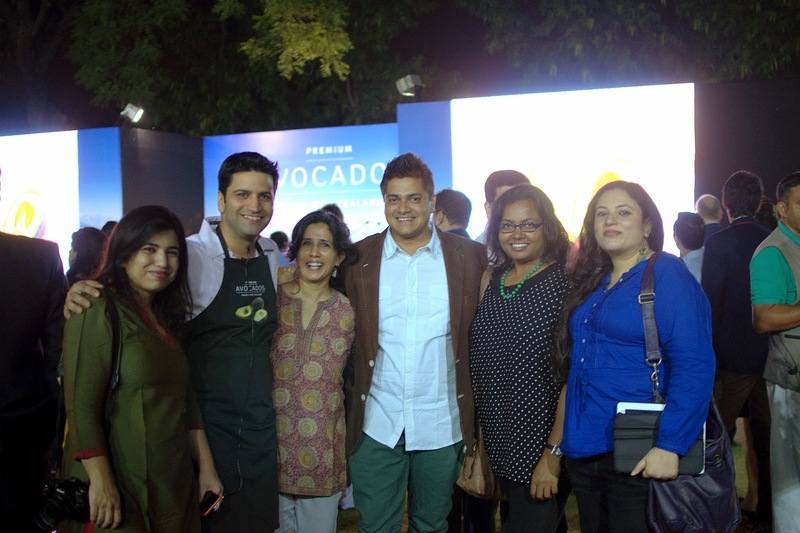 Recently the New Zealand embassy launched the Avocado season and introduced Hass Avocados from New Zealand (Avanza brand) and we witnessed various Indian foods being cooked with Avocados. 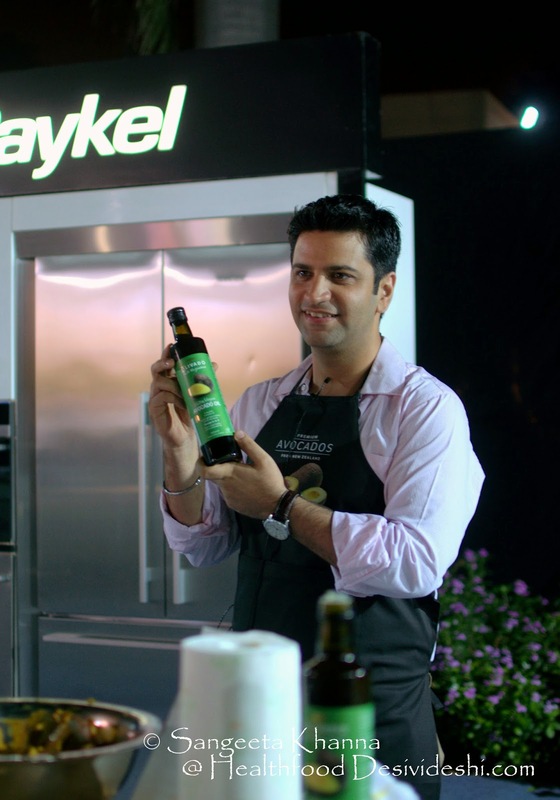 The talented Chef Kunal Kapoor was showcasing some culinary experimentation with Avocados and he cooked a Meen Moily style curry with Avocados, a Papdi chaat, Avocado cheese paratha and various desserts and soups using this wonder fruit. He mentioned that Avocados can easily be adapted to any cuisine pertaining to it's bland taste and yet rich texture it adds to any dish. Even Avocado oil is good to use in salad dressings and smoothies if you can get your hands on a bottle. 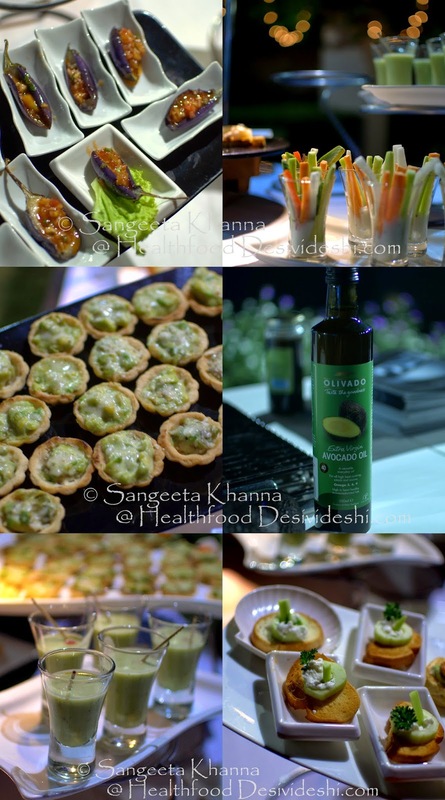 We tasted Avocado cucumber shots, tarts made with asparagus and avocado, kababs served with avocado dips and chutneys and toasties topped with avocado and mixed vegetables. It was an Avocado feast to speak literally. We even tasted a kulfi made of Avocados and loved it and a sago kheer with bits of avocado added, I loved that one too as it was very lightly sweetened. These were definitely the best Avocados I had found till date and I am glad these will be available in town till February end. Although I love using local produce but a few exceptions would include Avocados too. I am trying to grow them and have even planted a sapling. 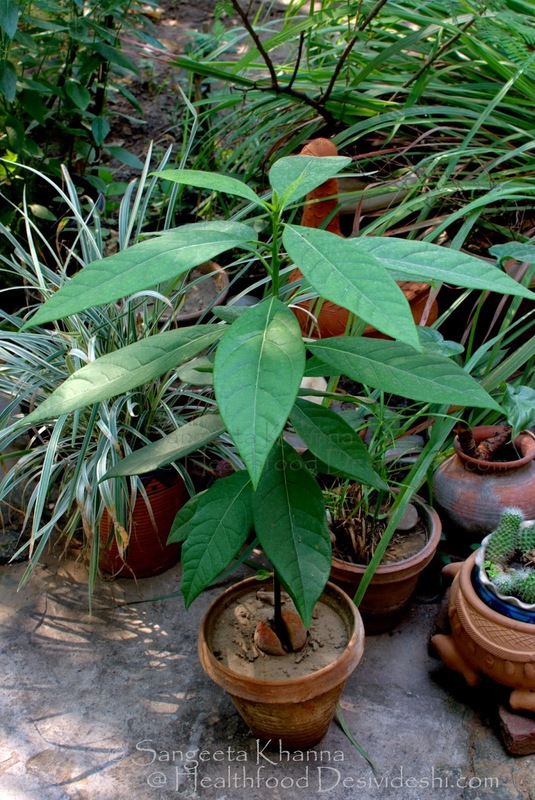 I grew this sapling from seed and am waiting patiently to reap good quality Avocados from my own yard some time in future. That would be the ultimate luxury for me. But the sapling needs a bigger pot and then will be planted in ground ultimately to grow taller and bear fruit. Till then I would have to depend upon the local or imported avocados. I have been adding them to my salads, smoothies and the good old Guacamole, the seeds always end up being planted regardless of whether they germinate or not. 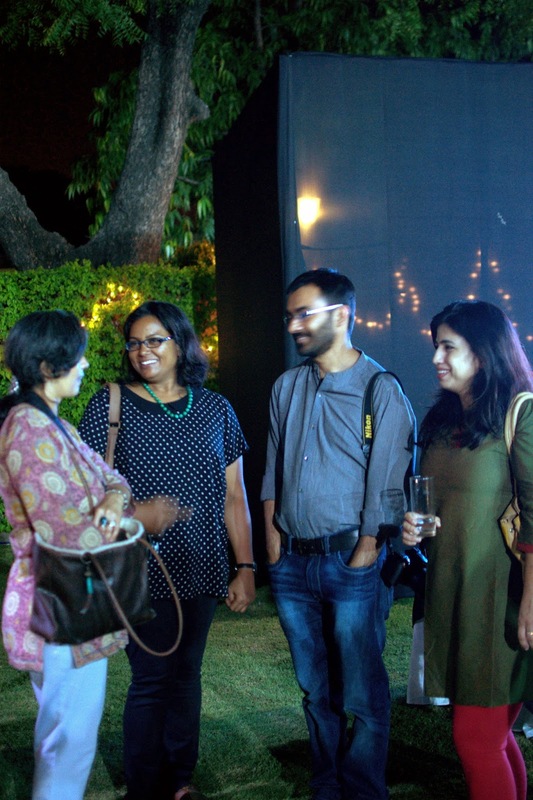 While New Zealand High Commissioner Grahame Morton unveiled the Avocados and spoke about how these will be available easily in India now, we met a few blogger friends and discussed food and photography and our experiences with raw avocados. Meeting Chef Saby and Chef Kunal is always a pleasure. The creativity and passion that they put into the food they cook is always infectious. Chef Saby talked about how he loves Avocados and has done s spa menu with Avocados being used liberally. 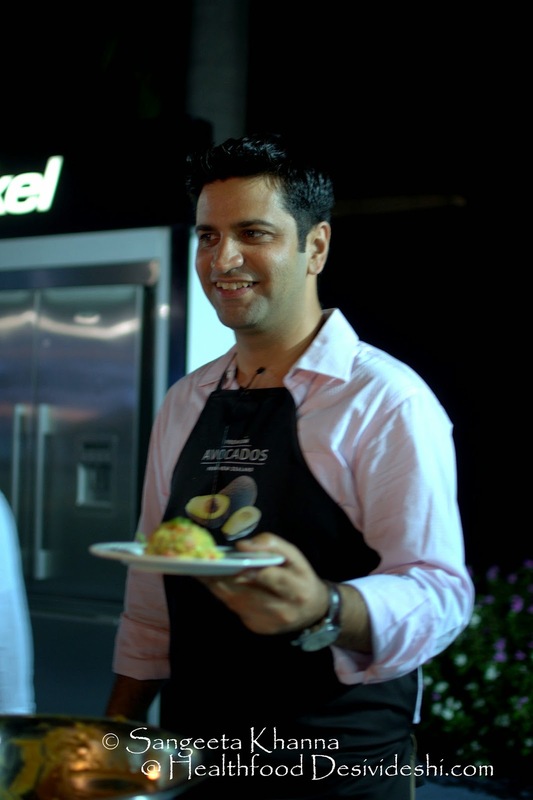 Here is the talented Masterchef Kunal with his papdi chaat with avocados. These Hass avocados from New Zealand are vaaialble in single and twin packs in INA market and a few high end grocers. We got a single Avocado pack each as a parting gift. 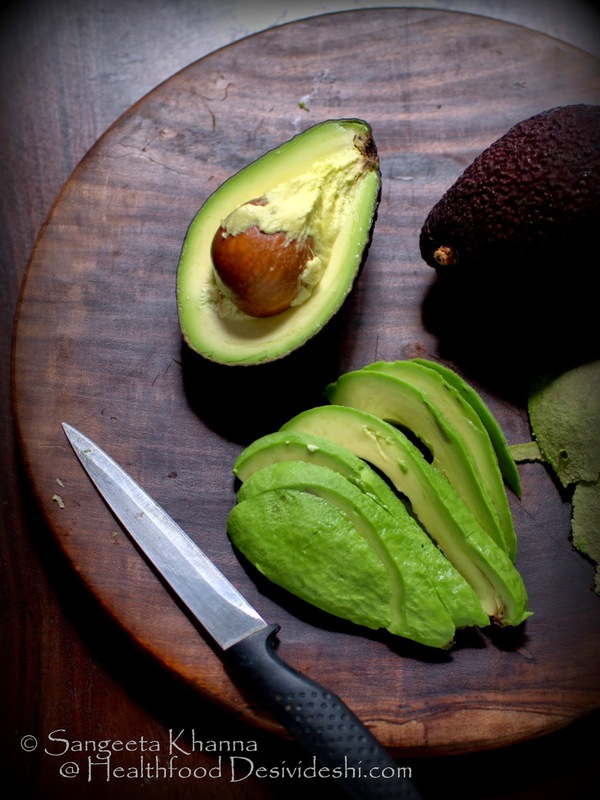 Fully ripe, brownish red skin and perfectly soft flesh of this avocado has the best taste and texture. 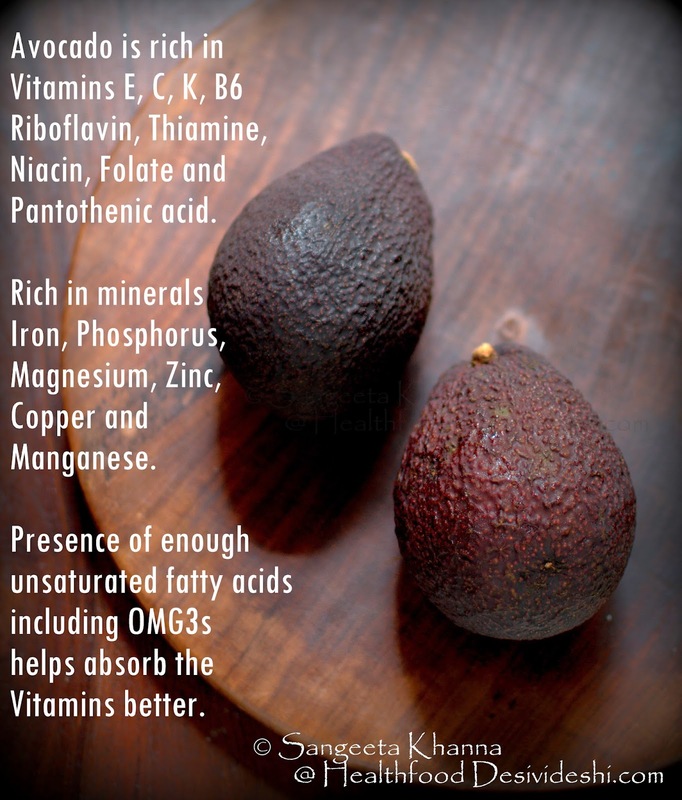 The avocado is fully ripe when the skin can be 'peeled off' the fruit easily and these were just perfect. I always use the Avocados in raw recipes and add them in soups when the soup is cooked so the avocado flesh doesn't get exposed to high heat. There is a significant nutrient loss when the avocados are cooked. I made this yummy fruit yogurt with them, using just three ingredients. Hung yogurt, home made strawberry preserve that I made last season and freshly cubed avocados. These made a dessert that is nutritionally balanced so the minerals and Vitamins in these help optimal absorption of the desired nutrients. 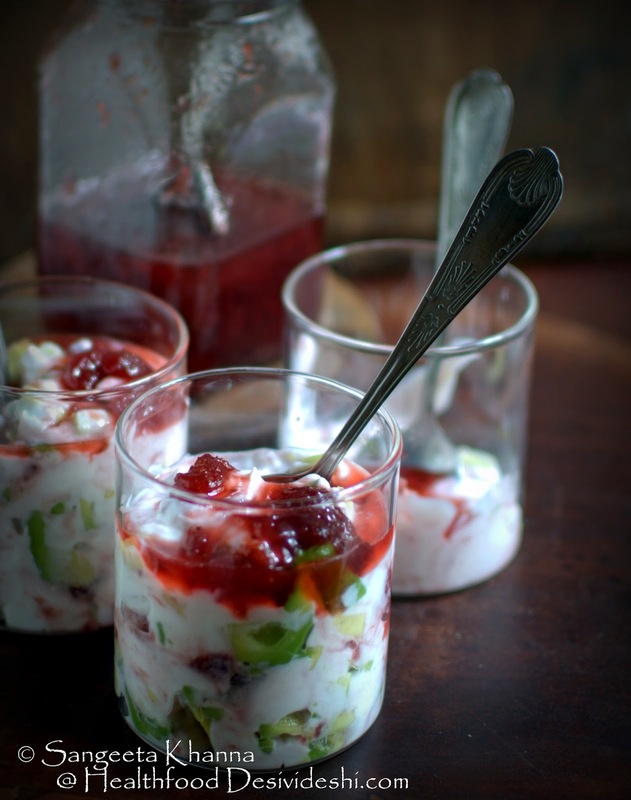 Will share the recipe in my next post, it is largely inspired by my strawberry and quark mousse I have shared earlier..
Another use of these avocados I did was to make a yummy avocado mayonnaise. 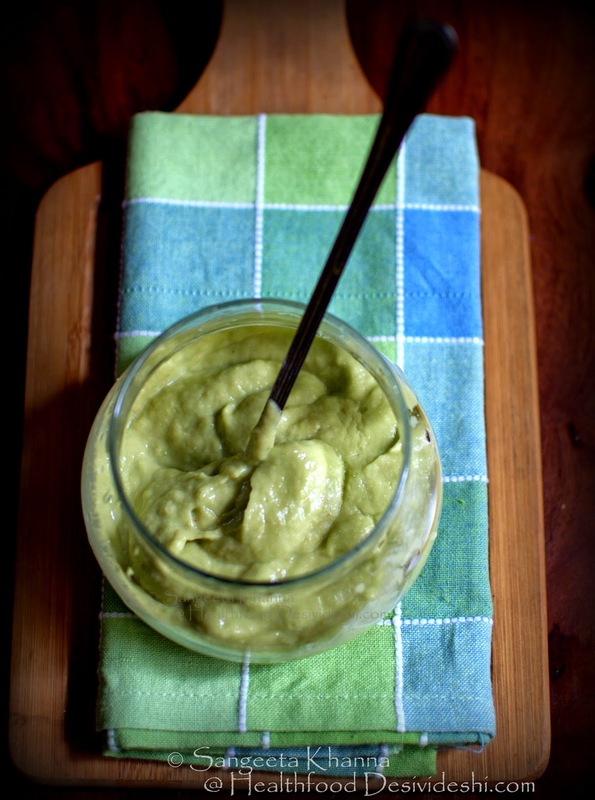 This is such a delightful vegan mayonnaise that can be used just about any which way you like. This mayonnaise was used to make a salad and with a chicken burger we had for dinner. Could not take pictures of my dinner but the recipe of this mayonnaise will be shared really soon. Stay tuned. There are these Avocado recipes and a few Diwali special healthy desserts coming your way.